Last night at Oasis Hotel, in Cancun. Mexico former IBF light middle champ Cornelius Bundrage regained his title with a dominant effort over reigning beltholder Carlos Molina. 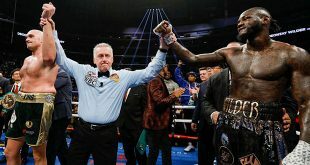 Making a mockery of his 41 years of age and shirt stature, Bundrage was in control of the contest from the first round as the normally busy Molina was put on the defensive after walking into a perfect right hand that dropped him in round one. The long-armed and awkward Bundrage simply stood off from the champion and picked his shots, timing Molina on the way in. The champion remained wary of the right hand and was never able to get his offense in gear. The Chicago man lacked the concussive punch neccessary to gain the respect of Bundrage, who consequently was unhampered by any efforts Molina did manage to put together. Bundrage produced another knockdown in the tenth and even though he lost a point for hitting the back of Molina's head in the eighth, still went on to regain the title via a 117-110, 117-109 and 117-106 points decision. Bundrage moves to 34-5 (19) while Molina falls to 22-6-2 (6). Could Bundrage be in line for a big money defense against the division's reigning attraction Saul "Canelo" Alvarez? There was a good card at O2 Arena in London, England on Saturday with featherweights Lee Selby, 20-0 (8), and Joel Brunker, 27-1 (15), tangling in an IBF eliminator. Welshman Selby set the pace the entire way as the oncoming Australian Brunker simply could not cope with the height, reach, movement and skill of the UK man. Despite landing some good shots, Brunker didn't have the defense necessary to neutralize Selby's style and an accumulation of punishment caught up with the visitor as the contest was stopped at 2:49 of the ninth round. Selby should now be next in line to face the winner of IBF champ Evgeny Gradovich's defense next month against Jayson Velez. On Friday at Salle Calypso in Calais, France European super feather king Romain Jacob, 22-0 (7), cemented his hold on the crown in a rematch win over the man he beat for the title, Devis Boschiero, 34-3-1 (16), on scores of 118-113, 116-113 and 115-113. Jacob won a split decision victory over Boschiero in February at the same venue and should now be on the short list for a crack at the WBC belt. 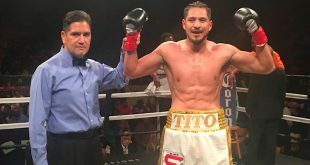 There was a rare world title contest on Wednesday which saw former unified middleweight champion Jermain Taylor, 33-4-1 (20), come back from years of sporadic activity to take the IBF 160 pound title from Sam Soliman, 44-12 (18), at Beaux Rivage Casino in Biloxi, Mississippi in America. Soliman was winning the first half of the contest as Taylor had trouble coping with the Aussie's difficult style but once Soliman injured a leg during a slip, the tone of the bout changed. 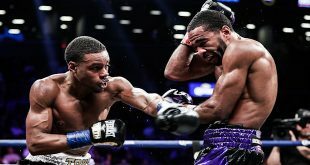 With Soliman's movement becoming more and more limited as the injury worsened, Taylor starting working the jab and right hand to good effect, producing knockdowns in the seventh, eighth, ninth and eleventh rounds although most of these resulted from the injury rather than absorbed punches. Taylor won his first title contest since 2007 on scores of 116-111, 116-109 and 115-109. Could there be a rematch? Given the high risk, low financial reward of fighting Soliman, expect Team Taylor to look elsewhere.